A fully digital weighbridge system that uses the latest technology in digital load cells was recently installed by QWM at Bemcove’s concrete recycling facility in Brisbane’s Acacia Ridge. The new system was supplied and commissioned by Accuweigh’s QWM branch, and has been designed to weigh all trucks entering and leaving the waste facility. A twenty metre long, concrete deck weighbridge was installed at the Bemcove site, which is supported on six digital weighbridge load cells, each with a thirty tonne capacity. To ensure optimal performance, the load cells are manufactured from stainless steel with an IP68 waterproof rating. Unlike analogue load cells, which return a voltage signal to a weight indicator for processing into digital weight readings, the digital load cells used in this new weighbridge system are fitted with an integrated micro-processor to generate digital weight readings. Each load cell is polled by a fully digital weight indicator via an in-built RS-485 communication port. The weight reading is then summed with weights returned from the other load cells in the system, and then shown on the weight display. improved fault finding capabilities with displayed error codes listing problems. 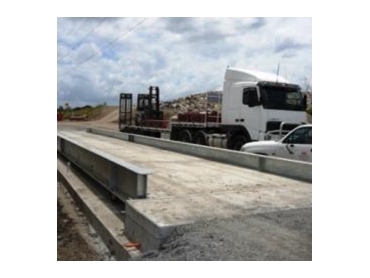 QWM’s weighbridges are fabricated using locally produced BHP steel at the company’s dedicated weighbridge manufacturing facility located in Geebung, in Brisbane’s North. In addition, for added protection against the elements, all steel used in QWM weighbridges is fully hot dip galvanised for strong corrosion resistance. QWM can supply both analogue and digital weighbridge systems for all heavy duty weighing applications, including weighbridges, silo and tank weighing systems.